← How to Maintain a Clean Car Interior? 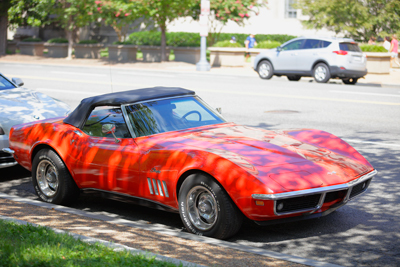 Now that summer is over, convertible owners may want to place the soft top back over their car. The top can become dirty even when it’s folded down. Convertible soft top cleaning requires a different process than cleaning the rest of the car exterior. Soft tops, also known as ragtops, can deteriorate over time, causing cracks and peeling throughout the fabric. Fortunately, you can prevent this by cleaning the top the correctly. To clean the soft top, use a car shampoo. Scrub the surface using a towel or moderately stiff brush. Do not use any detergents formulated for improving the car’s gloss. These are good for painted metallic surfaces, but detrimental for vinyl and fabric. Clean the top before the rest of the car and try not to clean in direct sunlight. To prevent the material from fading, use a protectant after washing the car. Most protectants also come with UV ray protection and other ingredients for preserving the fabric’s natural matte sheen. Other products utilize chemical-based solutions to repel water and other stain-inducing liquids. You can finish the cleaning by running a lint roller over the fabric to remove any small towel lint. The above instructions also apply to the ragtop’s rear plastic window. Don’t use Windex or other conventional glass cleaners. Don’t use a headlight restoration cleaner either. The plastic window is also prone to swirl marks. Prevent swirls by wiping with a side-to-side motion instead of a circular motion. In other words, none of that wax-on-wax-off stuff from Karate Kid. Some of our car protection packages include ragtop cleaning as part of a comprehensive detailing. Bellingham Detail and Auto Glass can restore every car area, including the upholstery, headlights, windshield, and convertible soft top, whether fabric or vinyl.